Large 9 carat yellow Gold 25mm x 2mm thick Hoop Earrings. 9 carat yellow Gold 28mm diameter large 2mm thick Hoop Earrings. Large 34mm Wide Hoop Earrings in 2mm thick 9 carat yellow Gold. 9 carat GOLD HOOP EARRINGS (per pair). 35mm size 9ct yellow Gold hoops in plain style. 9 carat yellow Gold Hoops in Large Super 42mm diameter size. 9ct Gold Super 2.5mm Thick Hoop Earrings in 21mm diameter size. 9ct yellow Gold Super 2.5mm Thick Hoop Earrings in 25mm diameter size. Large 9 carat Yellow Gold wide Earring Hoops. Size 32mm diameter by approx 3mm wide Hoop. Sold per pair. 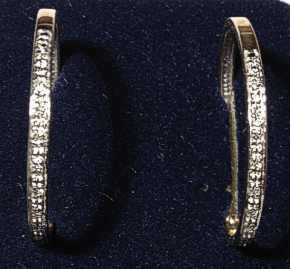 9 carat yellow Gold 18mm CZ set Hoops (pair). Large 9ct Hoops set with 5 graduated size sparkling Cubic Zirconia (upto 6mm size stone). 9 carat Yellow Gold Hoops set with Glitter effect CZ stones. 22mm square shape Sparkly CZ Hoops (pair). 9ct White Gold Heart shaped Hoop Earrings. Large Heart Hoops 26mm size, per pair. 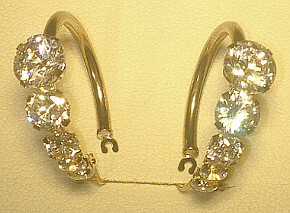 9 carat Fancy Large 32mm Creole Earrings, per pair. 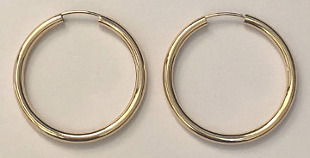 Small 9ct gold hoops sold in pairs, approx. 10mm diameter gold hoop earrings.